A.C.A.M. 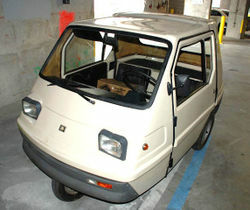 was an Italian microcar manufacturer built with Piaggio 125 or 218cc engines. Later a version was made with a 50cc engine. This was very rare small car with the well known Piaggio 125 engine and 4 speed gear box. These were referred to as the "Ape" ("Bee", in Italian) small transporter and there was no problem sourcing spare parts. These cars were produced for a short period and it's very difficult to find one at all.